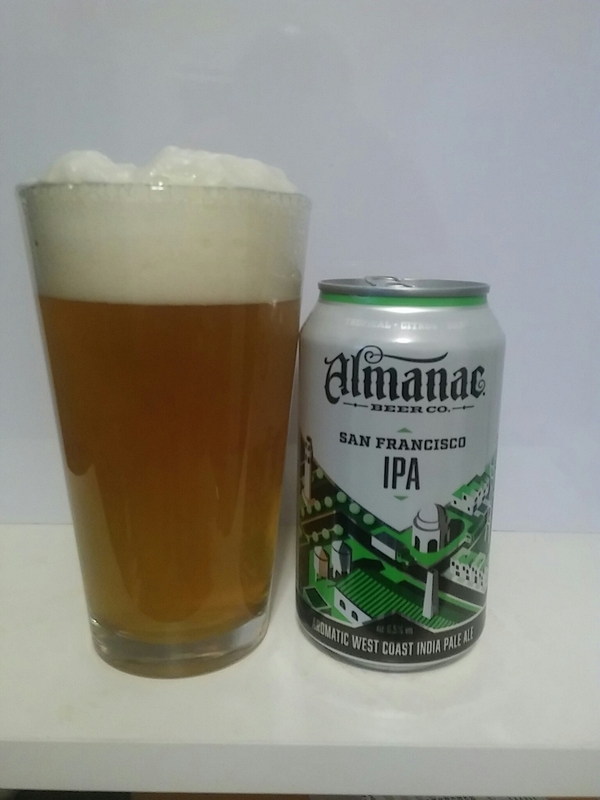 In this beer blog, we are going to get into the first beer from Almanac Brewery on this blog. It is their San Francisco IPA. I will get you a short history and then break down this beer. Almanac Brewery started in 2010 by Jesse Friedman and Damian Fagan. The brewery is located in the northern part of California. Let us get into this IPA. It has a cloudy bright golden color with a white constant head. The aroma has a citrus to grapefruit notes. The taste has a citrus to grapefruit notes with a dry hop bitter finish. It is pretty drinkable. This West Coast IPA features an explosive aroma of citrus, tropical fruit and dankness from a blend of Citra, Mosaic, Simcoe, Hallertau Blanc and El Dorado hops. Intensely hoppy without overt bitterness, a light malt backbone balances this IPA, giving it a clean finish and making it a beer to be enjoyed again and again. Inspired by San Francisco but brewed to be enjoyed everywhere. Enjoy with super burritos, hangtown fry, and rich cioppino. Our Fresh Beer Series delivers the best in farm fresh beer. Big flavors, bold yeast characters and huge hop aromas reflect our rich California agricultural bounty. Every beer is brewed, packaged and shipped with an eye towards maximum freshness. All of our Fresh Beers are designed to pair with a wide variety of cuisine—so enjoy a pour of The Golden State’s most flavorful beer. In this beer blog, we are going to get into another beer from Ballast Point. 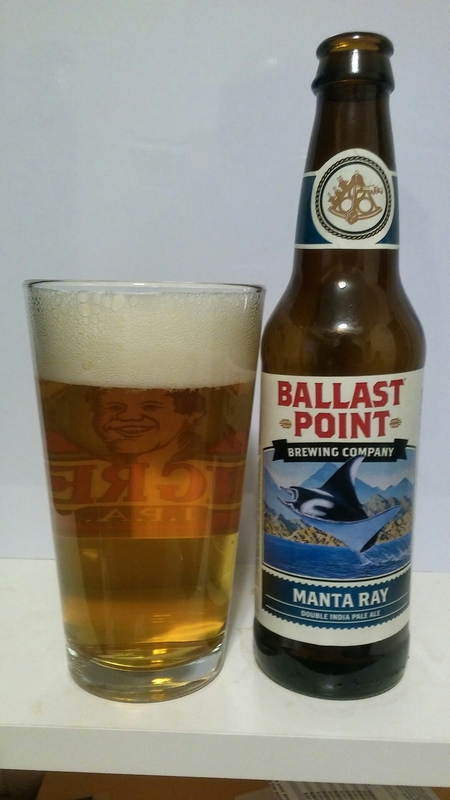 It is their Double IPA, which is called Manta Ray. If you read my earlier beer blog on their beers, you know the history of this California base craft brewery. If you have not, please, read them to get to Ballast Point Brewery. Let us get into this Double IPA. It has a clear golden color with a white constant head. The aroma has a tropical fruit to slight grapefruit notes. The taste has a nice juicy grapefruit to slight tropical notes with a dry bitter hop finish. It is almost like grapefruit notes. It is kind of drinkable for the beer style. This new IPA rises above the rest. We’ve developed many IPA recipes in our R&D program, but right from the tank, our Manta Ray Double IPA was a winner. Aromas of fresh, citrusy tangerine, melon and light pine leap from the beer and linger over a smooth finish. Like its namesake, this brew can sneak up on you – a big beer without a bite. In this winter beer blog, we are going to get into another beer from Anchor Brewery. It is this year’s version of their Christmas Ale. If you read my earlier beer blog posts on their beers, you know the history of this West Coast craft brewery. If you have not, please, read them to get to know this California craft brewery. Let us get into this Winter Ale. This is the forty-first annual Christmas Ale from the brewers at Anchor. It is sold only from early November to mid–January. The Ale’s recipe is different every year—as is the tree on the label—but the intent with which we offer it remains the same: joy and celebration of the newness of life. Since ancient times, trees have symbolized the winter solstice when the earth, with its seasons, appears born anew. Our tree for 2015 is the Deodar Cedar (Cedrus deodara), better known as the California Christmas Tree. Native of the Himalayas, it takes its name from the ancient Sanskrit devadaru, meaning timber of the gods. This coniferous evergreen, with its gracefully droopy branches and blue-green needles, has been a San Francisco favorite for over 150 years. The annual search for the perfect tree for our Christmas Ale label usually takes us far afield. This one began and ended with the search for a parking space near the Brewery! Getting out of the car, we couldn’t help but notice the way the late-afternoon sun danced amid the branches of two lovely Deodars just half a block from Anchor’s front door. Our longtime label artist Jim Stitt—who has been drawing trees for us since 1975—loved “our” Deodars and, like us, was amused that they were about as local as local gets! His charming illustration evokes the radiant beauty of our arboreal neighbors as well as the spirit of the season. Cheers from the Anchor brewers! 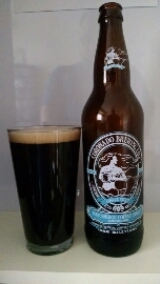 In this beer blog, we are going to sample the second beer from Coronado Brewing. It is their Blue Bridge Coffee Stout. If you read my earlier beer blog on their everyday IPA, you know the history of this California craft brewery. If you have not, please, read it to get to know Coronado Brewing. Let us get into this coffee stout. It has a jet black color with a tan to light brown color head. The aroma has a heavy coffee with a burn chocolate notes. The taste has a smooth creamy chocolate with a dry coffee aftertaste. It is pretty drinkable beer. Just as the iconic Coronado Bay Bridge connects our island home to the mainland, this java-tinged dry stout, brewed using dark roasted coffee beans from a local San Diego artisanal roaster, provides a bridge uniting craft beer drinkers with CBC’s rich, flavorful SoCal brewing traditions. Malt Profile: 2-Row, Crisp 45, Simpson R.B. 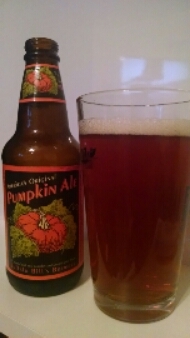 In this fall beer blog, we are going to get into the Oringal Pumpkin Ale from Buffalo Bill’s Brewery. Buffalo Bill’s is one of the oldest brewpub in the United States. It opened in 1983. It was opened right after the laws changed. Bill Owens, who is the founder and owner, wanted to serve homemade food with some great beers. In 1994, Bill Owens sold the brewery to Geoff Harries. Geoff worked with Bill in 1987 as the orinigal brewmaster. Geoff grew the brewerey into 40 states in the United States. This is information was pulled from their website (www.buffalobillsbrewery.com). Let us get into this pumpkin ale. It has a slightly cloudy amber color with a white head at first. The smell has a light to slight cinnamon notes. The taste of this medium body beer has a cinnamon notes with a crisp cinnamon finish. It is pretty drinkable beer. 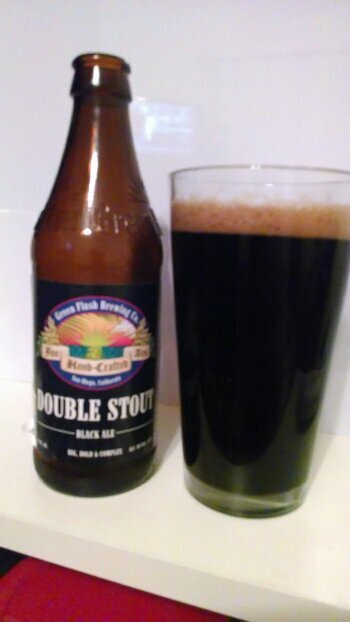 In this beer blog, we are going to get into another brew from Green Flash Brewing from California. Thanks again to my friend Jay for sharing this brew with me. If you read my beer blog post earlier, you know the history of this brewery from the southern part of California. If you have not, please ,read that beer blog post to get to know this brewery. Let us get into beer. It has a jet black color with a creamy tan color head on this stout. The aroma is chocolate, hint of coffee, and toffee notes. The taste is a creamy chocolate with a chocolate and caramel aftertaste. This double stout is a scary drinkable. Golden naked oats mashed with dark crystal and robust roasted malts create a luscious black brew with satin-smooth finish. An old-world style, done the Green Flash way. Big, bold, flavorful and complex. In this winter beer blog, we are going to get into another brew from Sierra Nevada. It is their winter seasonal called Celebration Fresh Hop Ale. If you read my earlier blog on their Beer Camper, you know the history of this brewery. If you have not, please, read the first part of that beer post. Let us get into the beer. 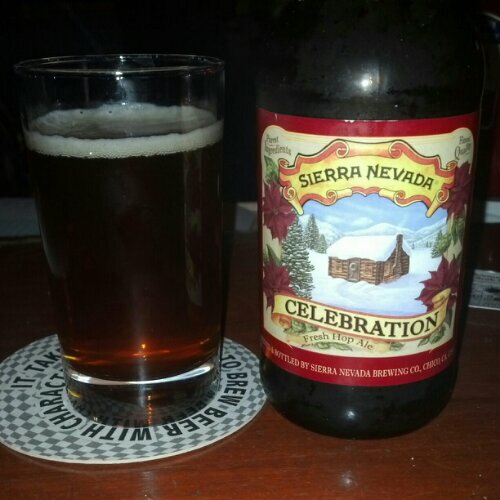 This beer from Sierra Nevada is called Celebration Fresh Hop Ale. It has a deep hazel copper color without a head on the beer. The smell is citrus to the beer. The taste is dry carbonation citrus with a dry aftertaste. Festive fresh hop holiday fun.